`one a them there mind-readin' portals'...Now, that really is a doozy Kris. `What're the neighbors gonna thank?' ??? With a plot like this, & such a rich palette of characters, I'm starting to wonder whether this is typical of everyone down there. Jesus-hair grass. Of course. 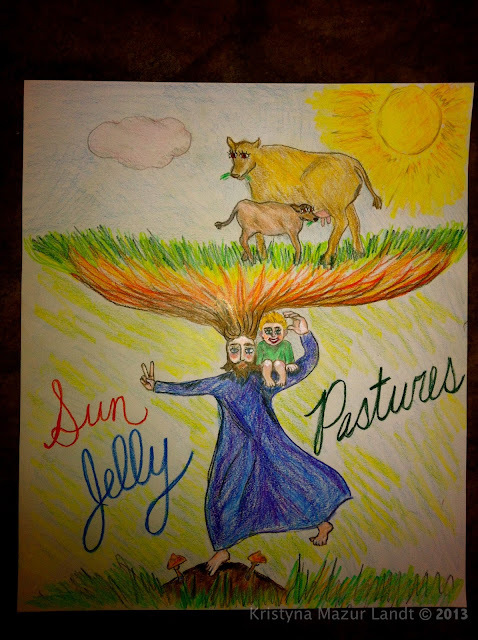 What and where else would cows at Jelly Sun Pastures eat? I love the "clinical posse." I think that should be an official medical term. And I feel for Maynard. For his wife who's being "picked on." How many people would trade places with a sick child or spouse if they could? Once again, I so lose myself in the story that the end sneaks up on me. I can't wait to meet Homer! The twister has gathered force! With such tragic turns, I am ready for a long haul. Although you have woven the atmosphere ever so vividly, the painting and the visiting card are integral to the story. 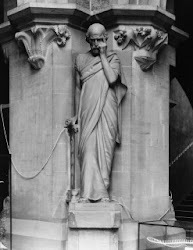 Pathos is intense. The glitter of the story is truly golden. Is there a redemption too? Indeed, Uma, there will be a redemption, and hopefully, it will add an interesting dimension to this story. I had to do quite a bit of research on this particular part of the story to determine what type of cancer would present with such symptoms, e.g. hallucinations. I located a case report from Mumbai of a 30 year old woman whose initial presentation of ovarian cancer was a symptomatic metastatic brain tumor. Gotta love the internet for that! It would have taken me months in a library to come up with that. Such imagination! And I love the picture. Beautiful. You really know how to put us right in the moment. I tweeted this. And, I REALLY like the picture. Jesus is the foundation and food for the spirit. It fits very well. Thanks so much, Charlene, that's so sweet of you. I am glad you enjoyed the picture. I hadn't planned on doing an illustration, but when I tried to describe Enid's painting in words, I remembered that a picture's worth a thousand words, and got out my sketchpad. Wonderful flow to the writing, Kris, so alive, so dynamic. Everything said, thought and felt by the characters seems so genuine, so real. I can feel Maynard's anger, confusion, helplessness and grief deep in my own gut. Thanks so much, Marty...I love hearing that kind of feedback. Although these characters are imaginary, I've tried to infuse them with the everyday humanness of real life and experience, ways that I've felt and ways that I've seen people react to difficult news. That is indeed some interesting artwork. The plot has definitely thinkened in this segment. You bring out the "character" in all these characters which are developing very nice. Can't wait for the next episode! Kris, I love your painting! Positively “innerestin.” Jesus hair-raising indeed in sunny, colorful splendor! It fits so well with the storyline. Even before I read Enid’s diagnosis, I had an eerie feeling where the story might be going when Enid began seeing little Sun Jelly everywhere. I know that sometimes when people are near death, they see loved ones who have passed on before them. I saw it happen with my mother. About three months before she died, when I would visit, she’d suddenly look around and say, “Rest in peace, go away.” She was seeing my father, her parents and her sister who had died decades ago. I think it’s a remarkable thing. Poor Maynard, I felt his intense pain when he heard about Enid’s diagnosis, and so soon after losing Sun Jelly. I think the part about having a terminal illness and no health insurance is very timely to mention. 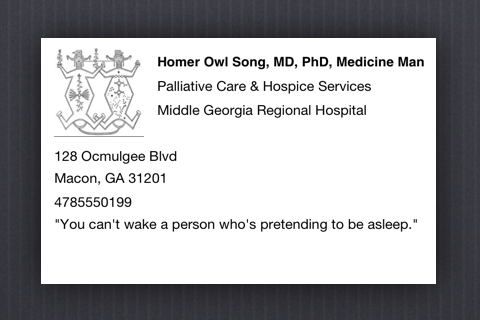 I really like your design for Dr. Homer Owl Song’s business card, and the quote too. “You can’t wake a person who’s pretending to be asleep.” Words of wisdom, and now waiting anxiously for the next installment (still pulling for Enid against all odds!). Btw, just have to ask, is “praise-a-cism” something you made up or Southern terminology (‘cause ya know, I’m a Yankee)? Praising and gently criticizing together, I like it! Amazing how a story can turn into something else inside the space of a paragraph. Nicely done. That's what I love about writing, Big D. It's like magic! Poor Enid, the news must have been so shocking to them both. I guess that's how it happens in the real world. I can't imagine what you'd say if you were told you only had months to live and all the thoughts about 'if only I had done this or that'. I'm so curious what the great Dr Homer Owl Song has got up his sleeve for her.... I just know there's a twist coming. Loved the crazy picture too Helena. Somehow, RPD, I think this bit of bad news is going to be as hard (or harder) on Maynard as it is for Enid. Homer's going to have to be pretty creative in his approach. NOOOO! Great story, Kris -- though I want a happy ending, dammit! These characters are too much fun to see them go through so much pain. You've really got a way with words, my dear.